Response: The results from this come out of MyVoice, a text message cohort of youth ages 14-24 representing every state in the country (http://hearmyvoicenow.org/). Each week we ask the youth in our cohort a series of open-ended to questions, with the goal of gathering the real-time opinions and experiences of youth across the U.S. This study reports the results of questions we asked MyVoice paritpatns between 07/2017 and 01/2018 about guns and gun control. (1) What are your thoughts about having guns in your home? (2) Do you think gun control laws would affect mass shootings? Why? (3) Who, if anyone, should NOT be allowed to own guns? We found that about one-third of youth in our diverse sample were “against” guns in the home, and the remaining two-thirds were either “pro” or “conditionally pro” guns in the home, stating that gun ownership is acceptable under certain conditions, such as proper storage, or kept away from children. Youth in our sample largely believed that gun control laws could decrease mass shootings, but one-third felt that gun control laws would not be enough to impact mass shootings. Response: Whereas most youth in our diverse sample are not firmly anti-gun, the majority of youth believe that gun control laws would reduce mass shootings. Like their adult counterparts, most youth are not asking to ban all guns or to repeal the second amendment; rather, they support legislative action that they believe would make their country safer. Response: Our findings show that the nuances of gun control in our country are not lost on youth. Youth have important perspectives to add to the public discourse on gun control. Unfortunately, policies that directly impact youth do not take their perspectives into account. MyVoice is committed to hearing from youth about issues that affect them and more work needs to be done to ensure that programs and polices are youth-informed. 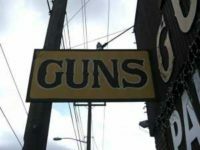 This entry was posted in Accidents & Violence, Author Interviews, JAMA and tagged gun control, guns, mass shootings, medical research, pediatrics, violence by Marie Benz MD FAAD. Bookmark the permalink.